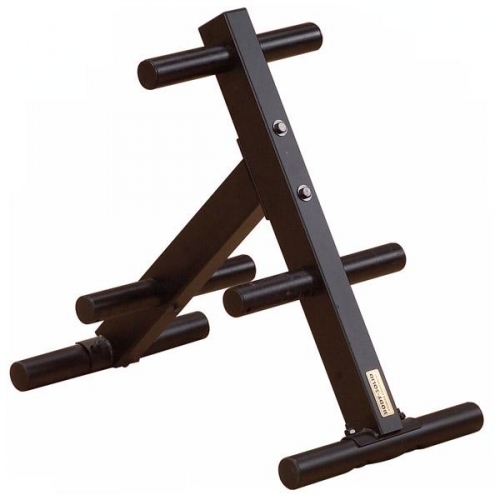 Keep your workout area safe and well organized with the smart PowerLine Olympic EZ-Load Weight Tree. Rock-solid EZ-Load design directs the weight load to the center, reducing the risk of tipping. The PowerLine Olympic EZ-Load Weight Tree has six storage posts that suspends your weight plates for fast and easy storage. 1000 lbs. of weight capacity. Call 1-800-875-9145 or Go to FitnessZone.com today to order your PowerLine Olympic EZ-Load Weight Tree. Rock-solid EZ-Load design directs the weight load to the center, reducing the risk of tipping. Six storage posts suspend your weight plates for fast and easy storage and retrieval. Super tough black powder coat finish resists chipping, flaking and peeling. Order your PowerLine Olympic EZ-Load Weight Tree from FitnessZone.com today!